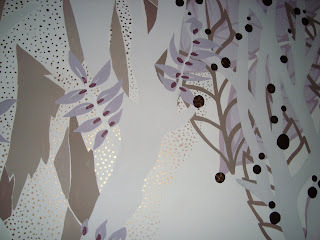 FAYE SUZANNAH: Black Cherry trees. As big of an effort that i make to avoid christmas, something eventually eats away at my sentiments and i get the gold and/or silver paint out. 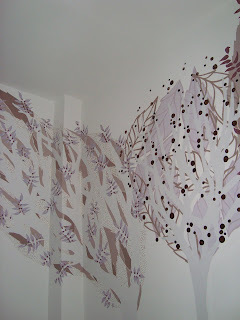 This week ,3 days were spent painting 3 trees in a gorgeous 4 story house in londn SW8,. My trees, although something pretty special, were nothing on the first Proper xmas tree i saw this year, 5ft high and towering over the wide-eyed toddler of the house. 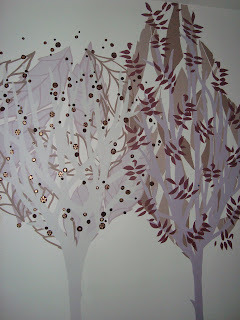 "Black cherry yoghurt" coloured paint+metalic details to this forest mural were a brave new move but thanks to the moral and practical support of my excellent helper Helen, i took the plunge and am super-proud to have contributed to the most stylish, and seasonal home i've seen for years.